I've remarked before on the ever-increasing desperation of multinational 'entertainment' corporations to protect their outmoded business models against the reality of technological development. Well, now another of these dinosaurs has fallen into the tar-pit. Sony/BMG has dropped itself into a potentially bottomless pit of poo by the use of a form of 'copy protection' on many of its audio CDs which is not only seriously intrusive, but could totally screw up your PC. 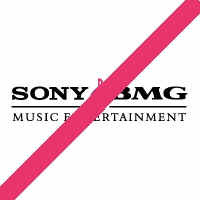 The only recourse we mere 'consumers' (or people, as I still think of us in my unreconstructed commy-liberal way) have is to boycott Sony/BMG's products. Luckily, there is comprehensive information at the corporation's own website which tells us who and what we need to avoid. A better idea is to avoid buying any 'copy-protected' CDs at all. Ever. Better still, write to the corporation in question and tell them that you won't buy any of their releases until they stop being so thuggish, arrogant and just plain bloody stupid. Sony/BMG seem to have turned chicken, at least for the time being. See here.